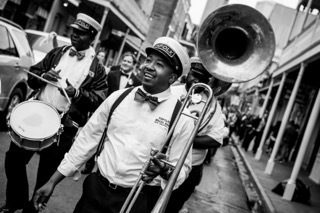 Founded in 2005 after Hurricane Katrina, the Kinfolk Brass Band is at the forefront of the New Orleans Brass Band renaissance. 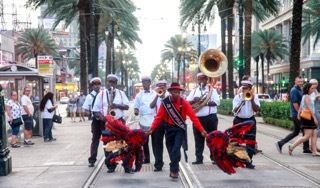 The band truly personifies the unique musical sounds of the City of New Orleans, playing a style of music that encompasses and melds Mardi Gras Indian chants, New Orleans funk, jazz, and traditional brass band sounds. 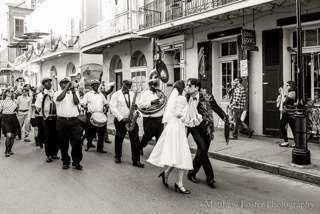 Booked in venues ranging from intimate clubs to grand ballrooms, and leading Second Line parades for hundreds of special celebrations, Kinfolk Brass Band’s music has been enjoyed by millions of people all around the globe. Whether performing on a large stage or in a small cozy setting, Kinfolk provides the highest quality of entertainment with their animated style and energy. They are sure to be the highlight of any event! For questions regarding the Kinfolk Brass Band, and for all your music booking needs, contact us HERE.